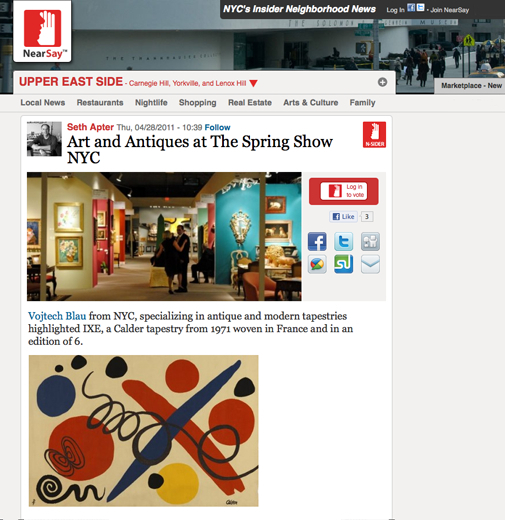 Seth Apter, writer for Near Say, a blog for ‘NYC’s insider neighborhood news’, spotted Alexander Calder’s IXE at the Vojtech Blau booth at the NY Spring Show. After moving to Sache, France near Aubusson in the early 70’s, Alexander Calder took a strong interest in tapestry leading him to partner directly with Aubusson weavers, particularly Atelier Pinton Frêres, and produce a series of spectacular tapestries. Calder’s deliberately restrictive color palette and his bold, simplified forms were perfectly suited to tapestry revived by Jean Lurçat flourishing in France mid-century. Contact us for more information about the work of Alexander Calder and other modern tapestries.